The day after Thanksgiving I was perusing the leftovers in my refrigerator, when, gasping with horror, I realized I had three hard-cooked eggs that I had been planning to use in an appetizer, but hadn’t had time to make. Now I had three eggs that I had to use within a day or they would be wasted. Oh no! Well, I’m not really an egg salad sandwich kinda gal and I didn’t feel up to a big project like a Nicoise salad. I could have put them on toast with goat cheese and a mint pesto, but that just didn’t sound appealing at the time. So what to make. 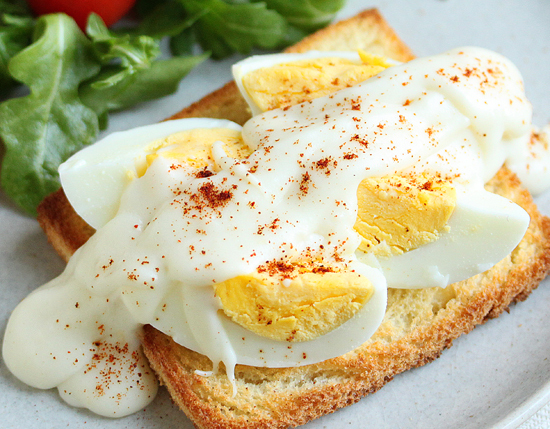 Then I remembered a simple supper dish my Mom used to make in the 1950’s when I was a kid – hard-cooked eggs on toast covered with a white sauce. Well, what are the holidays about but tradition and the comfort food of our childhood. So I decided to recreate that humble dish for a trip down memory lane. Béchamel is one of the mother sauces of French cuisine and is also used in Macaroni & Cheese, Italian lasagna, Greek moussaka, and on an English Parmo, which is a breaded fried chicken fillet topped with béchamel and cheddar cheese, which is then grilled or baked to melt the cheese. It is also the base for sweet and savory soufflés. This sauce is named after the Marquis Louis Bechameil, who was a financier and chief steward to French King Louis XIV. It first appeared in a cookbook by LaVarenne in 1651. I hope this is giving you good ideas for some experimental fun. I know it did for me. Place one or two slices of toast on serving plate. 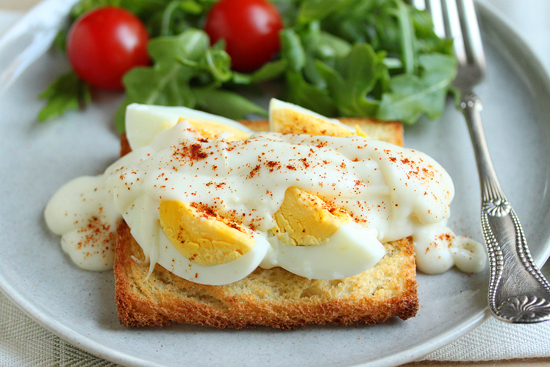 Top with sliced or quartered hard boiled eggs. Knap Béchamel sauce over eggs. Sprinkle with paprika, if desired. 1. Preheat oven to 400 degrees F. Cover sheet pan with aluminum foil. 2. Using one or two pieces of toast per person: cut off crusts and place firm sandwich bread on sheet pan. 3. Bake 7-8 minutes to desired color. Set aside. Note: You can also just use your toaster and leave the crusts on. 1. Place 1-2 eggs per person in saucepan and cover with cold water. Bring to a boil. 2. When boiling starts, remove from heat and let eggs sit in hot water for 10 minutes. 3. Drain hot water from pan and fill with cold water. Let sit for about 10 minutes until cool enough to handle. Peel the eggs and reserve. 1. In a saucepan, add onion, bay leaf and peppercorns to milk and bring to a boil. Cover and turn off the heat and infuse for 10 minutes. 2. To make the roux, melt butter in another heavy saucepan. Whisking constantly, add flour to butter and cook until foaming around the edges, about 3 minutes. Remove from heat. 3. Pour the hot milk slowly through a strainer into the roux, whisking constantly until it thickens. Add salt, pepper and nutmeg if using. 4. Return to heat and bring to a boil, lower heat to medium low, whisking for two minutes. Adjust seasoning. 5. If your sauce is too thick for your use, add additional milk by tablespoons to desired consistency. Note #2: You can skip the onion, bay leaf and peppercorns if you prefer. Your sauce won’t be quite as flavorful, but this sauce is so sweet and wonderful, it will be fine. This looks so fabulous! I just learned how to make Béchamel Sauce in cooking school and it easier than most would think. You make this sauce look divine! I learned how to make this recipe in high school home economics class. When I got married I couldn’t wait to serve it to my husband to show off my cooking ability. It did not go over well. It just didn’t seem like something a man should eat. But I can appreciate the fact that it is a really good meal. This looks like such a lovely breakfast or lunch. 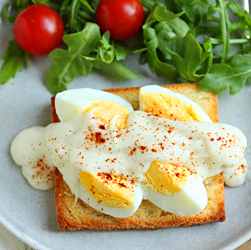 I love hardboiled eggs, but I’ve never had them with a bechamel sauce. What a great way to make an already delicious food taste even better. Thank you for sharing! Oh, the white sauce!!!! Perfect for so many things… I haven’t made bechamel in quite some time. I also find it amusing that you didn’t want to fuss over a nicoise, but managed to pull out a bechamel!!!! P.S. Bravo on your creative use of the hard-boiled eggs. I want this….right this minute! We used to have this too MANY years ago… but I think Mom used cream of mushroom soup for the sauce…. cut the boiled eggs up in the soup/sauce and added green peas. Not fancy, but filled up the many tummies in the house. I made this for dinner the other night, but I put the white part of the eggs(in small pieces) in the sauce, and I put several cooked egg yolks through a sieve-mashing it through with a spoon. So good!